Working in a hospital, a simple bed alarm has saved countless of the patients I've cared for from falling. You are truly blessed if your patient's bed is lucky enough to have one. If not, a chair alarm or a separate alarm made for any bed are great alternatives. Setting a bed alarm is usually pretty simple. Before the patient gets in the bed, you have to zero out the bed. The beds I work with have an actual button that says zero. You hold that button down and wait for the bed to confirm it is indeed zeroed out. Make sure you do this while all of the bed linens are on the bed. If you don't, when the patient gets up, the weight of the linens may cause the bed to think the patient is still in it. 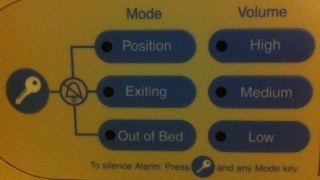 Many beds have different sensitivity settings for when the alarm sounds. 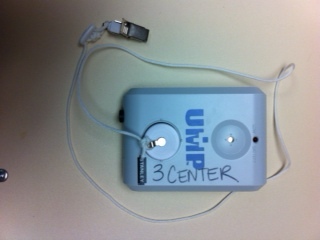 You can set it to go off when the patient moves towards the edge of the bed or when they get out of it. I recommend the former so you have more time to get to them. In order to activate the alarm, the patient has to first get in the bed and then you have to push the button that activates it. Every bed is different so it's hard to say what the button will look like but most will have an indicator light or make a beeping sound so you know it is set. You should test it out yourself by getting in the bed, having someone set the alarm, and then try to get out of the bed and make sure the alarm goes off. If it doesn't try zeroing it out again. If it still doesn't work, you may want to think about getting a different bed or using a chair alarm. If you ever hear a bed alarm going off, get to that patient as quick as possible. It only takes a few seonds for them to get out of bed and fall. One second can make all the difference. If you work in a hospital or similar facility, you should go to that patient no matter if they are yours or not. I immediately jump up and rush towards them when I hear one. It should become everybody's number one priority to get to that patient. You can tell a patient to not get out of bed by themselves and they may agree not to at that moment. But what happens when they wake up in the middle of the night and suddenly forget or you don't come to help them right away and they get impatient? This has happened to me countless times but because the bed alarm was on, I got there in time to make sure they didn't fall. You should especially put one on during the nightshift, which is when I work. Patients are at an even higher fall risk during the night because of them not being able to see in the dark. This is also the time when many patients with dementia get confused from a condition called sundowners. It doesn't matter how old they are. I have put the alarm on for patients of all ages. Many of them normally can get up on their own but they often get medication that makes them tired and dizzy. Even after you tell them to call, they may forget or get confused from the medication and try to ambulate by themselves. Many patients get frustrated when I put the bed alarm on. It makes them feel like they are in prison or they think I don't trust them. You have to tell them it's just precaution. They can't think of it as a form of restraints. It's for their safety. A lot of caregivers make the mistake of thinking their patient won't fall or will use their call light and wait for help. If you don't want them getting out of bed by themselves or if they are on bedrest, then you should have a bed alarm set. End of story. 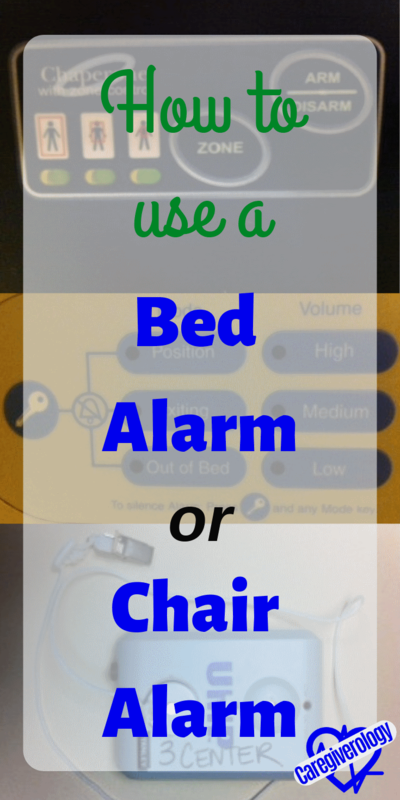 A chair alarm is similar to a bed alarm except they are portable and can be used anywhere. It is also a great and affordable alternative if your patient is a fall risk or on bedrest and their bed doesn't have an alarm. The kind I'm most familiar with is a magnetic one. They have two parts. The alarm itself, and a string with a magnet on one end and a clip on the other. The magnet sticks to the actual alarm and will go off when separated. You just clip the alarm to the chair or the bed and then sneakily clip the string to the back of their clothing or hospital gown. Once the patient tries to get up, the magnet will separate and sound the alarm. To turn the alarm off, just reconnect the magnet. Do not let them see you clip it on them because they might figure it out and take it off before they get up. Yes, I've had patients do this before. Just make sure it works by separating the magnet yourself before using it on your patient. If no alarm sounds, make sure it has fresh batteries. The other type of chair alarm is an actual mat connected to an alarm. The mat itself and how it is placed under the patient reminds me of an incontinence pad. It goes directly under their bottom and will sound an alarm when the patient gets off of it. Some models require you to press a button after the patient sits on the mat to turn the alarm on while others will automatically turn on once weight is applied. Of course, if you do have to turn it on, don't forget. However, all of them have a button that you press to turn the alarm off. Don't forget to test out the alarm yourself by sitting on it, turning it on, and getting back up. If no alarm sounds, switch out the batteries and try again. Just like a bed alarm, when you hear a patient's chair alarm going off, always rush to them. If you delay, that just gives them a greater chance of falling. But what if you are working in a hospital or similar facility and the patient isn't yours? Go to them anyway. It is always your duty. That patient's caregiver may be busy in another patient's room. You should instinctly jump up and rush towards that alarm as soon as you hear it. Just because your patient is awake and sitting up doesn't mean they won't forget to call and ask for help to get up and ambulate. I've had many patients simply refuse to call for help because they believe it is safe to get up on their own regardless of what you think. Others may tell you they will but then get overconfident and change their mind. 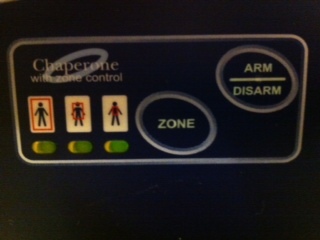 Many patients will be offended or annoyed with having to use a chair alarm. If they are, tell them that it's nothing personal and it's just a precaution. It's always better to be extra cautious rather than risk falling.